With the Pi‘s 2010 Photo Contest in full swing, July’s meeting is a good occasion to brush up on your photo editing skills. With nearly every Mac user possessing a version of iPhoto, this software application offers a good foundation for demonstrating various photo enhancements. This how-to presentation should be just what the doctor ordered when it comes to dressing up your intended contest submissions or for anyone else interested in polishing up their photos. Travis Good, an avid photographer and gifted presenter, will be on hand to show the audience several techniques and tips for cleaning up photos and bringing the content to life. The presentation will center on using iPhoto ’09, with some references to Aperture 3, Apple’s premier photo management software. And as a bonus, we will have several past contest winner on hand to pass along some of their favorite tips and tricks for taking their winning shots. Come pick their brains and bring some of your images on a suitable medium to be critiqued. 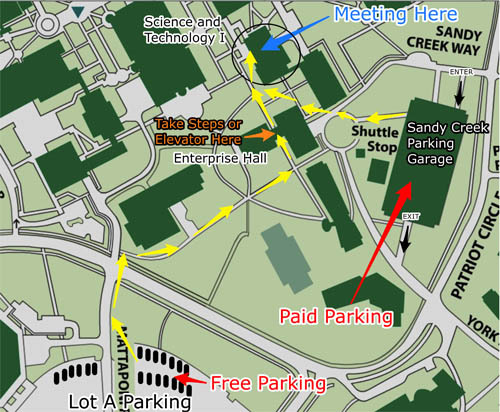 The meeting will be held on the GMU campus in the Science and Technology I Building, Room 131, which is at ground level. Check back closer to the meeting date for any updates or changes. Park as close to Mattaponi River Lane as possible, then walk north along that road toward the main campus buildings. The sidewalk route takes you directly to the side of Enterprise Hall (our other meeting location). Pass through the Enterprise Hall walkthrough by going up a long set of stairs or using the elevator inside the building. Continue ahead and the Science and Technology I building will be on your right. Our meeting takes place just inside the front of the building, at the entrance level. We will attempt to have signs up to guide you to the location.